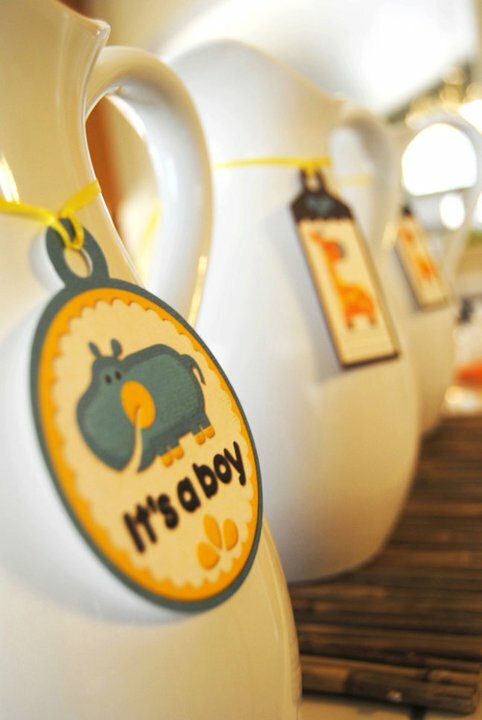 Scheme Events had a great time scheming up ideas for this safari baby shower for a wonderful mom to be. We began our inspiration with a giant umbrella tree commonly found in the safari. We created the truck of the tree out of butcher paper and the leaves out of green colored tissue paper. It looked fantastic and provided a great focal point in the room. The tables were covered with the same butcher paper from the trunk of the tree and a light ivory burlap table runner giving the room an organic feel. 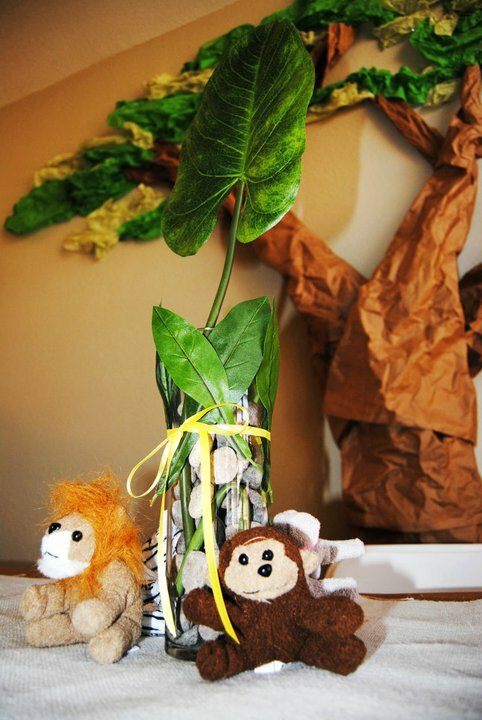 Centerpieces were created with river rock and banana leaves. The young stuffed animals were the final touch. 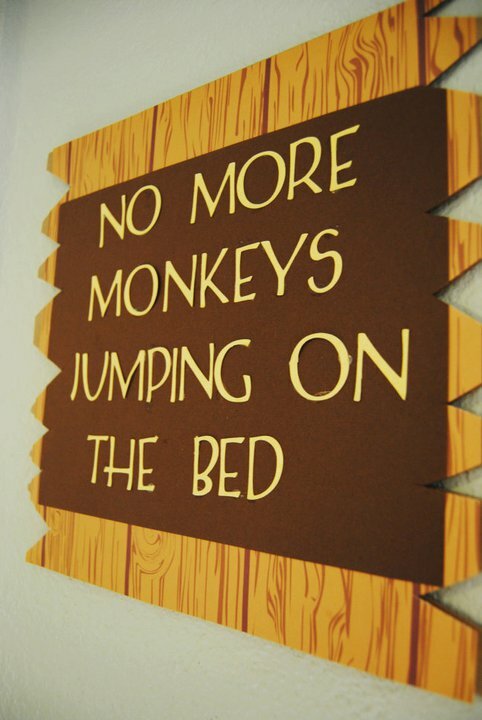 Signs were created and placed throughout the house with fun monkey sayings. For instance, Monkey See, Monkey Do and No More Monkeys Jumping on the Bed. 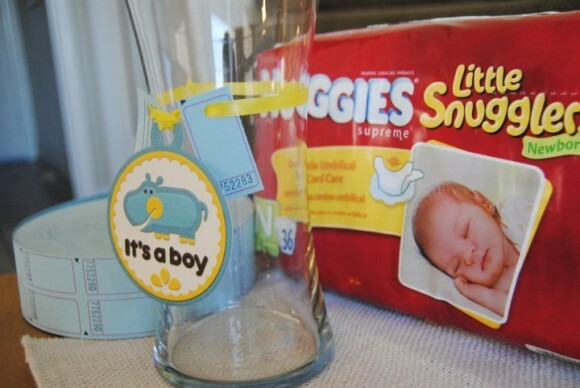 Labels were used throughout food and beverage to make this baby shower truly custom. 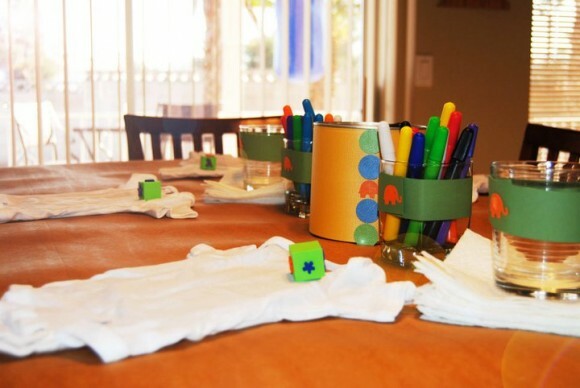 A baby shower isn’t a baby shower unless there are games to play! Mom to be wanted traditional games and we loved that. However, Scheme wanted to provided a touch of personality and cuteness to each of them. 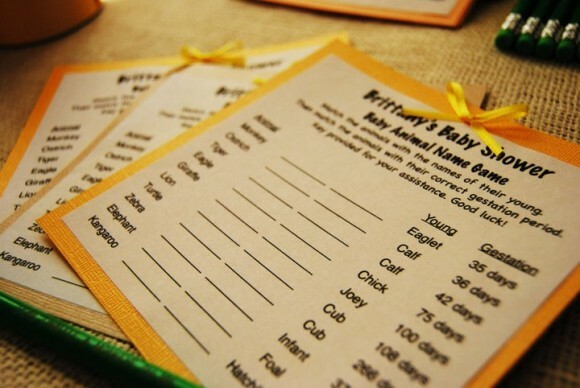 First, guests were asked to pick their favorite childhood book and write a dedication to the baby. 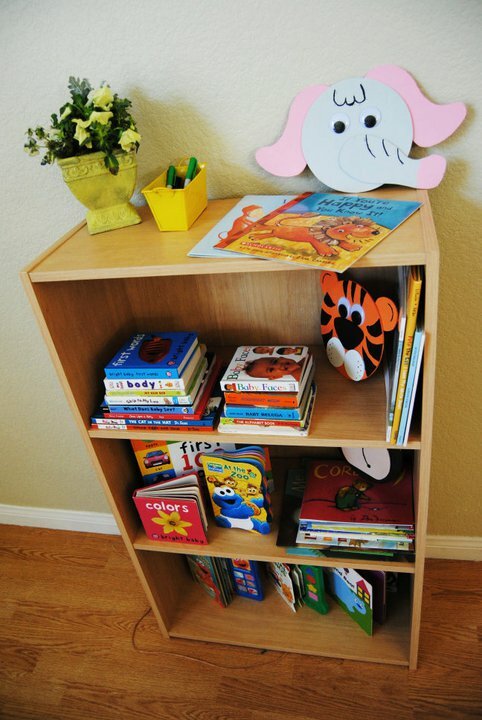 A Perma Child Safety brand bookcase provided extra decor and a great gift for mom to be. Especially a mom as concerned with safety as she is. 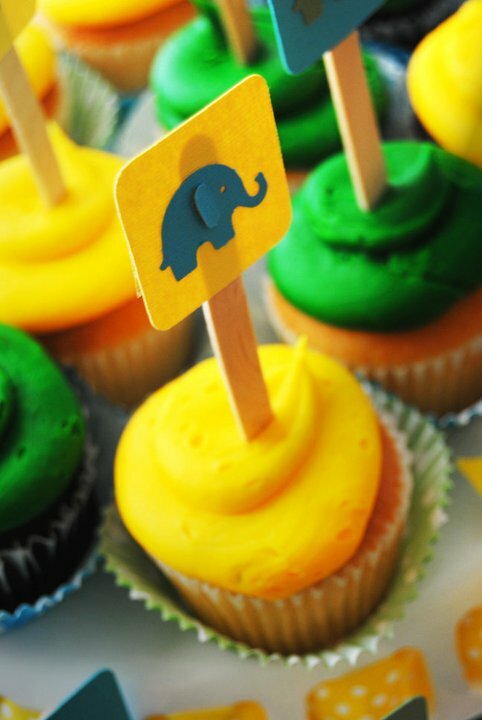 The Baby Animal Name Game was the perfect choice for our safari themed baby shower. We personalized it by adding a little bit of color and a cute yellow bow. The green pencils were also custom with “Lions, Giraffes and Monkeys, Oh My!” engraved in each one. We also created a station for a baby food tasting. Guests were encouraged to taste, smell and observe eight different baby foods and guess their flavors. This game was a lot of fun and interactive for the guests. In addition, guests were able to personalize their own onesie for the baby. 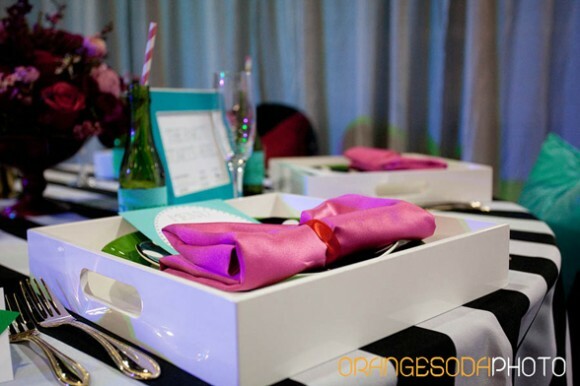 Scheme provided fabric paint, paint brushes and stamps for guests to be creative. They all turned out really cute and mom to be looks forward to taking pictures of her baby in each of them to share later. Lastly, guests were asked to bring diapers in exchange for a raffle ticket to win the grand prize. The table filled up quickly and we were happy to have helped mom to be with this major expense. 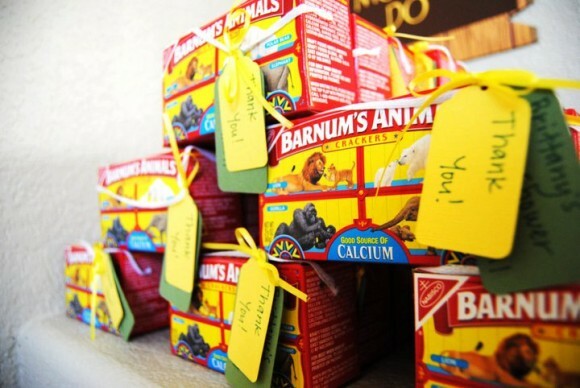 Mom to be thanked her guests for coming with animal crackers and a personalized note. Congratulations Brittany on your new baby boy! 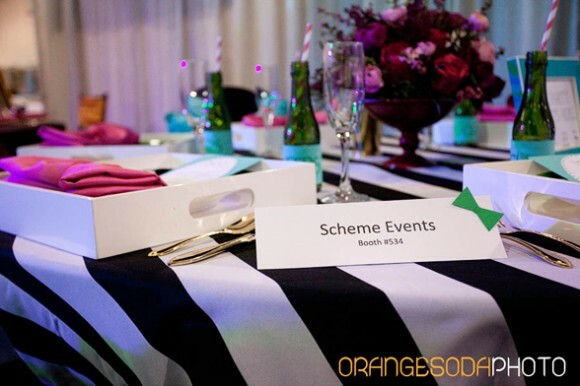 Thank you for allowing Scheme Events to be a part of your special day. Photos courtesy of Amanda Cox. Scheme Events would like to welcome everyone attending WPPI (Wedding and Portrait Photographers International) this week in Las Vegas. 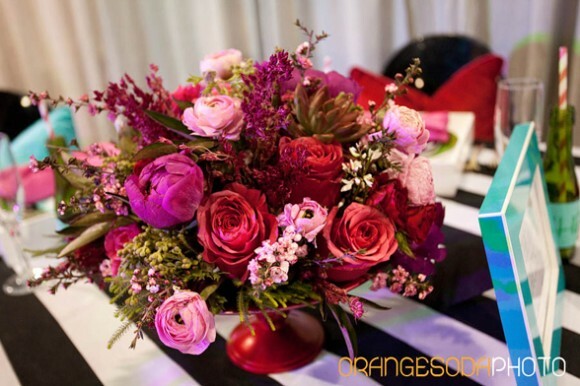 WPPI is an amazing convention to attend if you are in the wedding and events business. Photographers from all around come to Las Vegas to network, see trends and learn about the wedding and portrait industry; of course we can’t forget to mention WPPI brings a week of fantastic events throughout Las Vegas. Scheme Events will be participating in a photoshoot with some fantastic photographers. We look forward to this Love is in the Air inspired photoshoot this Thursday, February 24th! Working with the following photographers is such an honor for the Scheme girls and we hope you are excited to see what these amazing ladies capture on their cameras. Stay tuned for photos of this upcoming shoot and be sure to follow us on Twitter as we will be tweeting throughout the day; you might even get a few sneak peeks! When we were asked to come up with a tablescape for the entrance of Inspiration Avenue at Bridal Spectacular, we wanted to do something completely different than our booth design. We were out shopping when we came across a green Kate Spade plate, which sparked the discussion of how much we loved the recent Kate Spade holiday ads. Our table inspiration was born! We started pulling items off the shelves and mapped out our table design in the middle of the store (this is a normal occurrence on a shopping trip with the Scheme girls). Images found on the Kate Spade Facebook page. “Utility, wit and playful sophistication are the hallmarks of Kate Spade“. We came up with an unexpected color combination by combining red, teal, kelly green and fuschia with the black and white awning striped linen from Creative Coverings. Red and teal pillows were added to the black ghost chairs (provided by FWR Rentals) to give it a cozy “at home dinner party” feel. Gold flatware from RSVP Party Rentals added a pop of metallic and “playful sophistication” to the table. White trays from West Elm were used as chargers (our guests may want to get up from the table and mingle while holding their dinner! 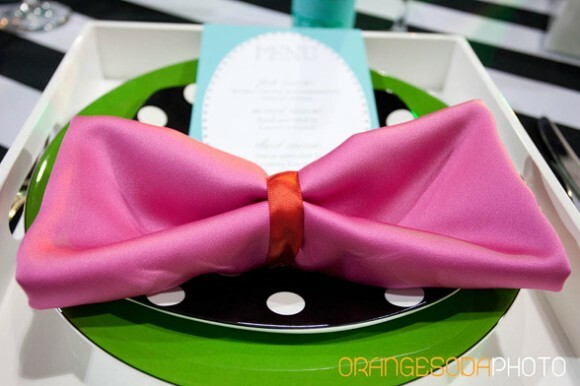 ), and we layered polka dot plates and a fuschia napkin folded in the shape of a bow on top of the green Kate Spade plate. 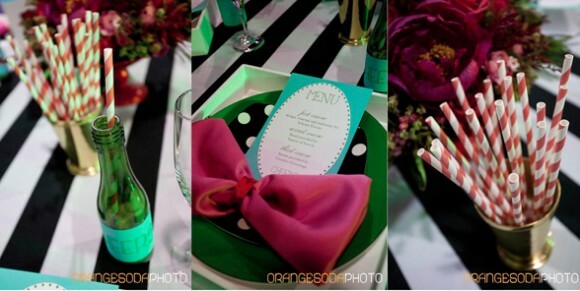 Mini champagne bottles with “cheers!” labels were used as favors. Red and white striped straws made them easy to enjoy! 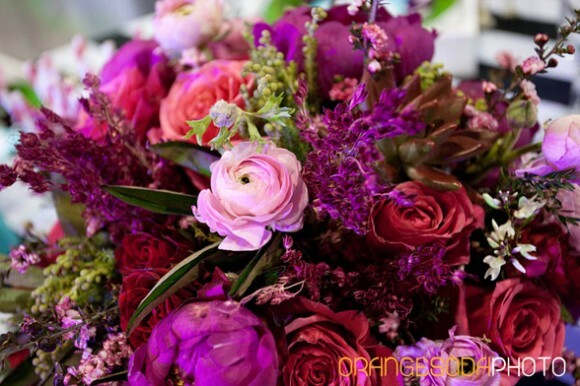 Layers of Lovely provided the beautiful floral arrangement that was the center of our inspired tablescape. 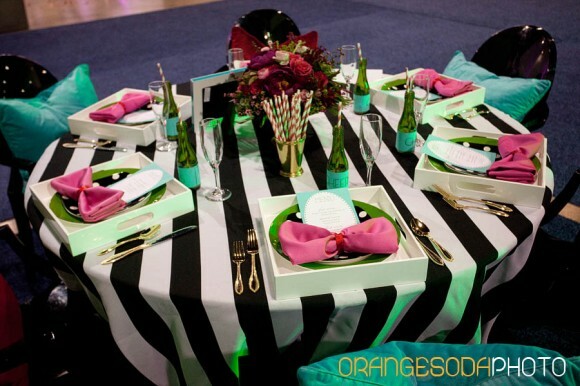 Thank you, Orange Soda, for taking these pictures of our table. We really can find inspiration anywhere; the next time you are out shopping, look for us setting up a tablescape in the middle of the aisle. 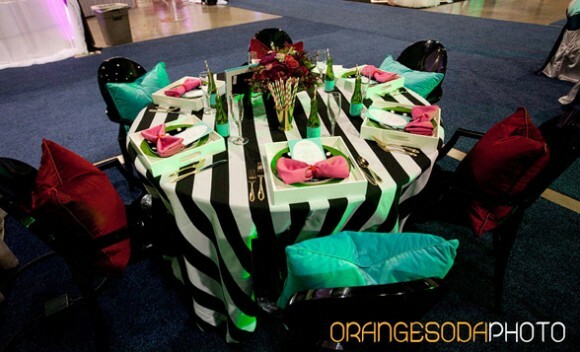 We may just be coming up with our next big idea for a dinner party, wedding or inspiration photo shoot!